At work, I use the programs mostly to draw maps and diagrams. I don't know how to do anything artistic. 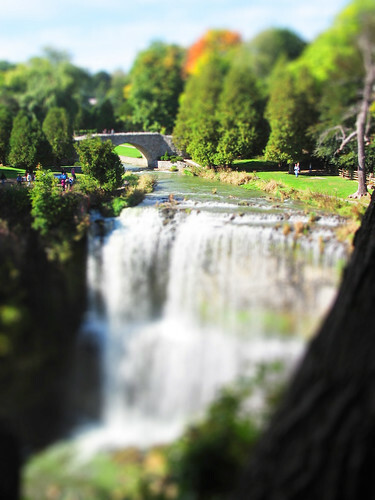 But last week, I found out about the latest Flickr craze, called tilt-shift miniature fakes. The technique for this Photoshop trick makes normal scenes look like museum case models. How fun! I was inspired to put Photoshop to some non-work related use and give it a go. I didn't have too many ideal photos for the trick (high vantage point, bright lighting, simple composition), but this was my best result so far. The original unaltered photo is here. By the way, if you're not on Flickr yet, what's the hold up? It's a party every day. I love how one person will have a cool idea, like this one, and then everyone tries their version of it. Sharing is good. add some contrast to it, light still looks too natural, adding more contrast will make it look more artificial. easy way is to use B+C, but I would use levels. Tilt and shift are functions of large format cameras (4x5 Cambo's etc). With these techniques, the digital world has made another analog piece of equipment nostalgic. P.S. I will be giving Renee & my Mom a Photoshop tutorial some day soon. You are more than welcome to join in!